We set off to the North in search of the portal that UOPETA had managed to confirm the presence of. The first scouting trip turned up nothing, but we haven't eliminated it from the map altogether. We'll continue with the normal routine until all of the major suspects have been taken care of, and then we'll revisit some of the dismissed ones. For now though, we had a confirmed portal to destroy! 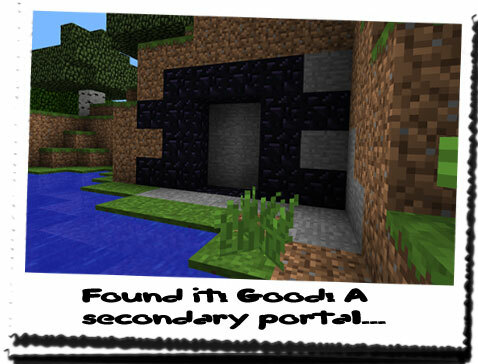 UOPETA had only said it was a standard portal, but anything is better than nothing! It might not take down an entire array of portals, but it's a start... I've stuck rigidly to the methods that UOPETA taught me; hiding under trees, remaining in shadows until I know the way is clear. One particularly helpful tip he told me was to not move my eyes! As mad as it sounds, it works! As any area we search around in is a natural environment, there will be loads of moving objects: plants, trees, animals etc. By moving your eyes and head, you reduce the chances of seeing anything. If you keep your head still and focus on a specific spot, you'll be surprised what your peripheral vision will see! I've already taken my blow pipe out countless times, but on each occasion, it has either been a tree or an animal! I suppose I need to refine that skill now so I only react to real threats! We neared the area that UOPETA had found, expecting to see a tunnel, or underground cave, maybe a hole in the side of a cliff. but instead we found a small pool of water with an overhanging tree. After a few moments, we found the portal. 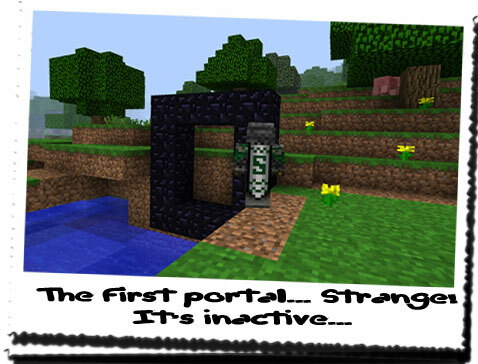 Like UOPETA had said, it was only a standard portal, but it was also inactive! It didn't really matter as I had decided to bring my diamond pickaxe with me anyway! Destroying a portal the hard way was time consuming and tiring. The sun had begun to sneak into the lower half of the sky as well so to speed things up, we decided to take turns. THEROS started out by hacking at the portal, whilst I stood back and kept watch. Just because it was a standard portal didn't mean it wasn't being watched by someone! Besides, I was more concerned about UOPETA's sighting of a Creeper! That's the last thing we want stumbling through towards us through the treeline! After half the portal was destroyed, I took over and demolished the remaining obsidian. After a long while, the remaining chunks of obsidian fell into the water, and the dust blew away on the wind. "One down... Innumerable portals to go!" I clipped the diamond pick on my back, and we began the wait. There was no point in us moving anywhere until we knew whether UOPETA had found another portal or not. Same as it was pointless to head back to base, only to be called back out minutes later. Instead, we sat in the shadows of a copse and had a snack. We needed to keep our strength up because who knew how long we'd be away from the base! It was still rather bright considering the position of the sun in the sky, and we were beginning to wonder if we were going to get a call from UOPETA before it got dark! "If UOPETA's doing this systematically, then logically the next one will be to the South East. We'll have two options: take the long route and avoid the conducting tower, or skirt around the edge of it." As I was in charge of safety and security, I thought that the best bet would be the former. But thinking about it again, we didn't really have time to waste. We could head straight South East and avoid the conducting tower. It was risky, but much faster. THEROS began to speak again, but UOPETA called us on the radio at that moment! "Found the next one. Head to the conducting tower and continue East until you reach the coast. Once there, head due South and you can't miss it! It's a secondary portal, but it's inactive. Another good find! See you in a few hours!" I confirmed the location with UOPETA and we set off to the secondary portal. "South East! Just like I said!" Another boring journey despite all the hype caused by the Creeper sighting. I had begun to think we would almost definitely find one, especially if UOPETA had sedated one! But we managed to skirt around the treeline surrounding the conducting tower unnoticed, and we made it to the ringed location on the coast. That was a good question. The portal wasn't active, so we couldn't rely on the sounds of the rift guiding us, nor could we use the Solus stone! The problem with the maps was they were only accurate to a certain degree. Pinpointing something as small as a portal on one was rather difficult. I was also beginning to wonder what landmarks around this place had made it a suspected location for a portal! It begun to get dark by now, and we were worried that we wouldn't find it! If it wasn't active, it wouldn't give out any light either, so finding a portal constructed of a purple/black stone in the dark was practically impossible! The last we wanted to do was to light a torch to find it! That would be suicidal, especially as we were so close to the conducting tower! We spent nearly half an hour looking for it, expecting to see a hole leading underground again, but there was nothing. "Do you reckon... Do you reckon it's underwater?" I hadn't considered that... Would that even work? Could a portal even operate underwater? 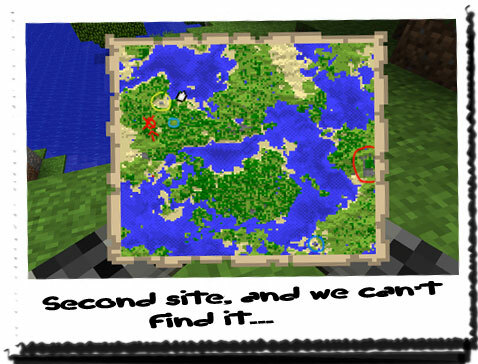 Well we hadn't had any luck finding it so far, so we had nothing to lose. Setting the bag down, I waded out into the water, peering into the water for any sign of a dark material. I couldn't see anything... Turning around to face the land, I shrugged at THEROS, not having found anything yet. Then I saw it... It was on land, but it had been obscured! It was facing out towards the water's edge and was concealed by a small bay with an outcropping. From above you wouldn't even see it! "Found the next one! It's to the North East. This'll be the last one for the day, and then we'll head out. Keep your eyes peeled. This is an active secondary portal. There are bound to be guards nearby..."
"Off to the next one then..."
Day 101: Much needed rest! Close encounter of the REALLY undead kind!